Rated 5 out of 5 by JustTheFacts from What Price Redemption? GAME SUMMARY & BONUS CONTENT REVIEW Cute puppy? In Red Cem? I thought they’d gone too far, but they pulled it off! It didn’t feel a bit awkward, the dog felt like a natural part of the story. It’s the storyline we’ve come to love. You have been hauled out of your normal existence by the will of the Cemetery, and must find and save three lost souls before you – and your puppy! – are released. Let’s just assume you’ve read how awesome the graphics are. Incredible improvements in ERS’ cut scenes too. Music and voiceovers are both more varied and it’s an improvement. I’m sure you’ve seen the lists of collectibles, achievements and other fun stuff in the other reviews. Yes, the game is easy. It’s also varied, imaginative, exciting and fast paced. I’m thinking if this is the new order, and I think it is, I’ll be taking power naps between chapters in future games! Don’t you just love it? BONUS CONTENT REVIEW ***** We have: WALLPAPERS, CONCEPT ART, VIDEOS, MUSIC, PUZZLES, HO GAMES, SCREEN SAVER, STRATEGY GUIDE. All of which are pretty excellent actually. We can replay the games with the PUPPY outside the main game (I’ll beat that Tic Tac Toe cheater eventually). And we have the BONUS CHAPTER. If holding your dog hostage seems a pretty mean thing to do, wait til you get to this chapter! Redemption Cemetery was always fairly low key evil, the emphasis being on the saving of souls. Welcome to the new gloves-off Redemption! More magical, fanciful and downright scary than any before, this quest tops all our other ‘salvations’. The bonus game takes the length of a standard chapter to complete, in almost exclusively new locations, new puzzles, even new games to play with your pet. It’s a great adventure and makes the CE version of this game a MUST HAVE! Rated 5 out of 5 by syndney1099 from I love puzzles! Like many previous reviewers, I have played the previous Redemption Cemetery games and really enjoyed them. This one is just as fun. Lots to do. If you are new, while it's busy the advantage is that you can play this game many times to pick up all the things it has to offer. The "extra" minigames that you need to play to give your raven powers needed to progress, add to the storyline, which I really liked, rather than some tack on busywork. It's very linear, so not overwhelming. They are not hard but not silly either. It was nice to also be still a minute and appreciate the amazing artwork and graphics. The puppy aspect is fun rather than the usual, save the boyfriend, brother, husband, child, etc. And no car crash to start with! As in many games, there's a helpful map. A nuance of this game is that you get diverted to a "subgame" to get what you need to solve something in the main game. It's much easier than running to and fro. Overall, really fun and worth the money. Rated 5 out of 5 by Babssil from This Game ROCKS!!!!! I don't usually review games but this game absolutely Rocks!! ERS you have out done yourself. Your games just keep getting better and better. The storyline is awesome. The graphics superb. The game play is fun and I don't want it to end. Kudos to ERS for a job well done!!! Rated 5 out of 5 by RedPoppies from Loved this game! I've just finished playing this game - and I absolutely loved it!! Graphics are clear and easy to see on a notebook screen (not all games transfer to a smaller screen so well), and the storyline is easy to follow with some twists that keep you on your toes. I don't as a rule buy CE games, but when I started playing this on the trial I knew I had to have it! The puppy is a cute addition, and the extra games you play with him are a nice bonus. I've got the other Redemption Cemetery games and this is the best one by far - and that's saying something! Congrats ERS and Big Fish - you've come up with a winner here! Rated 5 out of 5 by Powrtoc1 from Short, but sweet Game was focused, not too difficult, and easy to maneuver around. Not too many HOS and well varied. Main menu was quite creative. Hint and ship buttons recharged in a reasonable amount of time. Not much back and forth, and the map area was relatively small. A nice afternoon of relaxation. Will we see another Redemption? I hope so. Rated 5 out of 5 by BereniceP from Thoroughly Enjoyable Fourth in Series and the best yet. Rescue three souls from the cemetery and have fun on the way! I loved this game. The challenge was just right and no boring scene travelling (having to go 6 scenes ahead to find an item which you then have to go 6 scenes back to use). There is a map for easy travel. Hint system is excellent. I also loved the HOG scenes where you find the items in silhouette and each item is used somewhere in the scene to find the next item. Rated 5 out of 5 by jmcbeauty from Another great Redemption Cemetery Sequel I really enjoyed this sequel. As I own and have played the other 3 multiple times, this one starts out very well. Didn't come close to finishing the demo as I got involved with the puppy that the trophies are centered around. There are some morphing places but nothing that you can collect. The story begins with you being on the wrong train to Redemption Cemetery. You have been brought there intentionally to free the spirits that are trapped. Hira is holding you dog hostage until all of the ghosts are released. There are medals and toys to locate for your puppy which you have to name. I particularly liked the letter on the opening page that is addressed to you from ERS. The visual was well done and on the dark side (you are in a cemetery, what do you expect). 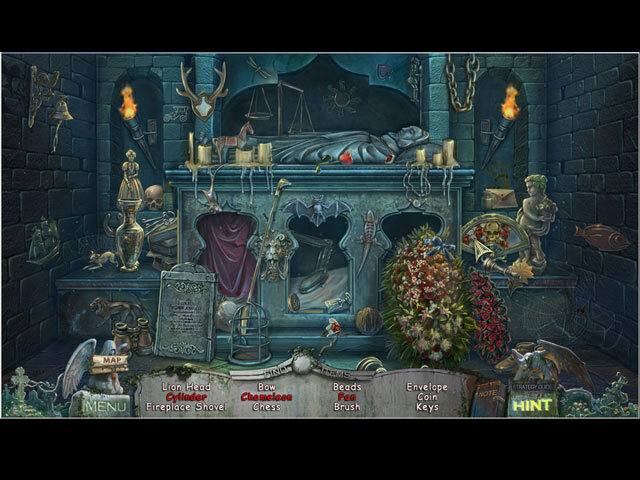 The mini games are not bad and the hidden objects are not hard to find. You can keep your raven helper charged by solving the puzzles and can recharge as often as you like even if you don't use full power each time. The strategy guide was well done, and the map is interactive. The music was good and the voice overs worked well. Definitely a buy for me. If you liked the other Redemption Cemetery games you'll enjoy this one. Rated 5 out of 5 by BFGMCFFAN from Redemption Cemetery is back! I've been a fan of this series, since the first game in the series came out and the fourth one was worth the waiting. First of all: this game can be played in widescreen. That's great! The storyline is different to the other three games, but it has similar parts. Again you start on an old cemetery and again you have to save three people in different situations and locations. That's great, because this is typical for this series. The music is as good as in the other games. It fit's perfectly into the game. I love the epic music. The level of challenge in this game is very different. 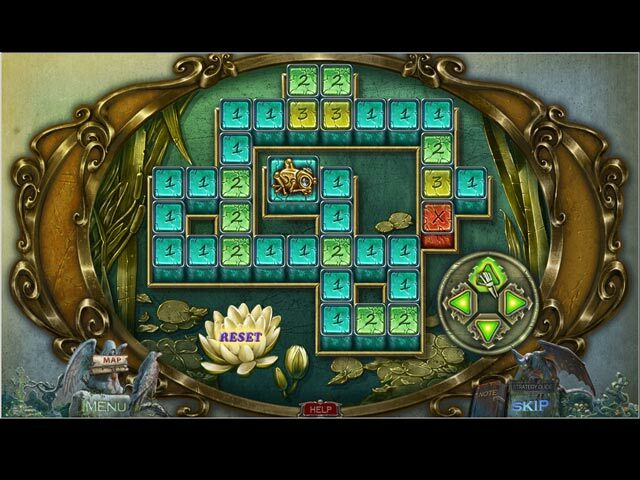 Sometimes the gameplay or the puzzles are very easy and sometimes it's very difficould to continue the game without using hint or skip. So for beginner to advanced players, for everyone is something in the game. The graphics are great. In every chapter there are wonderfull graphics with many details. Within the game you can collect things and play minigames with a little puppy. You can also earn trophys for this. I really like it, because the puppy is very cute. The only bad thing is, that the main game was not very long. I finished it in 3 hours. But for me this matters not, because the game is really worth the money. ERS did a great job again. A five star game. Rated 5 out of 5 by biscuitsmama from Be Sure to Try This Excellent CE! Redemption Cemetery: Salvation is IMHO the best of all the Redemption Cemetery games to date. The game starts as you are riding the subway and it makes an unscheduled stop at a cemetery where your dog is kidnapped by Hina, who gives you the task of aiding three troubled ghosts before she will release your dog. This is where your fun and challenge begins. It goes without saying that the graphics are terrific. ERS is my favorite game developer, and they prove with this game that they keep raising the bar with each new offering that comes to market. I love the artwork and creativity that the ERS team has given us with the latest edition of the Redemption Cemetery series. Along with the artwork and quality graphics we have excellent audio with music, realistic voice-overs, and ambient sounds. Of course, I love the animals that appear throughout the game. I have said it many times before, IMO that no developer does animals as well as ERS, and the ones in this game are exceptional. Being a huge fan of dogs in general, I immediately fell in love with “my” kidnapped cocker spaniel who I will work to retrieve throughout the game. In order to assist us with the various challenges we encounter on our journey, Hina provides us with a raven companion. What is fun in this game is that we must first activate the raven’s abilities before he will assist with various tasks. You can’t simply ask your raven to do something but must solve a puzzle first, which adds to the challenge and enjoyment of the game. As with the other Redemption Cemetery games we have stories within the story that make it easier to leave the game when real-life calls and return to it at a later time. 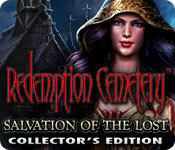 Redemption Cemetery: Salvation is truly a CE value that is loaded with extras. Among the extras we can earn medallions to unlock mini games. According to the strategy guide we can replay 23 mini games as well as hidden object scenes. Another plus with the game mechanics is an interactive map that allows us to jump from one location to another. The map also indicates if there is an objective or something to accomplish in a specific location. I recommend that you demo the game to see what fun the ERS team has cooked up this time - an excellent 5-star CE that you shouldn’t miss! Rated 5 out of 5 by pennmom36 from I SEE DEAD PEOPLE....AGAIN! Another great Redemption Cemetery! You find yourself on a train with your faithful puppy companion, but thing are a little odd and when the doors open you find yourself at an eerie cemetery. Here you will learn that you have been chosen to help the restless souls move on, and even worse...the keeper of the cemetery has taken your dog to assure you will complete the job! This game has taken the developers a year to complete and you will be grateful for their dedication to make this a great game with good graphics, eerie music and fun mini games. The HOS are a mixture of list items to find as will as silloutted items and find 12 pieces of ice etc. all of which are interactive. You will also get achievements for your puppy (you get to name him) such as medals, or making him a toy. There are a lot of things to do in each scene so you can't possibly get bored, most items you find are used within that scene or the next and some items need to be combined as indicated by a plus sign. You will also be given a raven to help you powered by resources such as earth, wind, fire etc. As you help different souls they will give you these resources and to charge them you have to complete a mini game which are pretty simple as most are fun as well. Once charged your raven will be able to fly to places you can't reach or locate things hidden in the ground. There is a lot of action in this game, try for yourself and I think you will agree this is a keeper. Enjoy! Rated 5 out of 5 by gussusie from DO BUY!! I loved this game! I have the first one and WILL be getting this one too!!!! I played this on advanced but will put it on hard when I buy it. It has three levels for all to play. Enjoy this game!!! Rated 5 out of 5 by mikado1 from ERS did it again! Great game. Have been waiting so long for a new game and I am really happy over that ERS once again has provided us with a great game, maybe the best ever. Beautiful graphics, sound and music good. Loved this game from the first minute I played. Don´t miss it! Rated 5 out of 5 by pam72149cunningh from Redemption Cemetery: Salvation of the lost An excellent game. My hour trial went by in what seemed to be twenty minutes. I rarely purchase a CE but couldn't wait for SE. Thanks to all. Rated 5 out of 5 by MSBAM100 from More Redemption! This game is the fourth in the series, and the best one yet. You ride a train with your dog and three ghosts and of course wind up in the cemetery. Hina, the keeper of the cemetery keeps your dog until you help the three spirits get redemption. As before, there are 3 stories to solve. New additions include medals to collect for your dog -- 4 sets of 5 and you get to play a game with your dog. Also, the magic raven buddy you receive now not only flies, but digs and has powers of water and fire as well. You have to play a clever mini-game to "turn on" the power of each element. Of course there is the notebook, and the map, and the hint button that fills quickly. You still combine inventory items to make a new, more useful, item. Only one HOS in the demo, but the mini-games are fun. Your first ghost is a zookeeper, so there are lots of things to do at a zoo for the first story. ERS has done it again! Rated 5 out of 5 by bishky from I LOVE THIS GAME!! If you have played the other Redemption games (I sure hope you have - they are great fun) you will absolutely LOVE this one. I was so excited to see this game come out. It is beautifully drawn and sound and voices are great. Music is just an addition to the play and not distracting at all. There is so much to do and see. Move your cursor all over the scene as there is stuff to do and find all over the place. 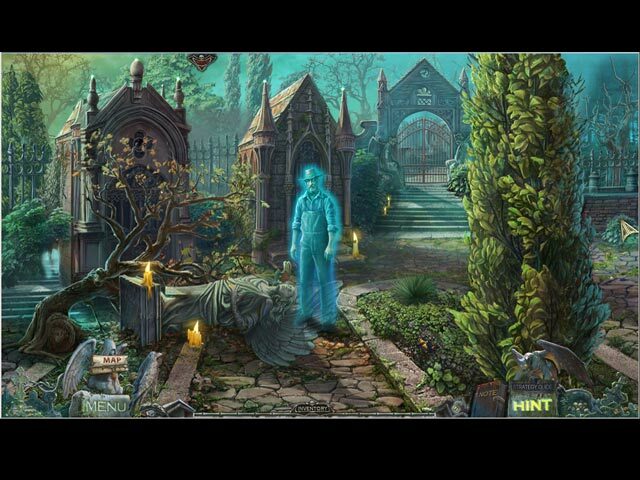 You get helpers along the way and lots of mini-games to play besides the hidden object scenes. The storyline is really good and just flows along. The help button is good if needed. You have to think about what needs to be done and figure out how to do it. This game is just loaded with fun from the get go. It is a buy for me when it comes out in SE. Can't swing buying the CE but just loved the try me. I will be waiting for it but hope you enjoy it as much as I will. If you haven't played the other Redemption's please try them, you will love them. Rated 5 out of 5 by neilskinut from another great ers game Cool game and ERS has added new ideas to this one. Has a map and hint button works good. Good voice over and graphics. Music is also good, not distracting. Has a good flow with not too much going from one seen to another. Has a map which helps. You have to find things also for the dog. Some of the puzzles are harder than others. I did not find too many HOS but they are normal. I have all the redemption cemetery games and they are all good, this one I think could be the best. You have a crow that will also help you. Again good game. Rated 5 out of 5 by 1955raven from Five stars for Salvation Ten minutes in I knew I would buy this one.,great story grapics exceeds all other redemption games. If you have not played these games your missing out.!!!!!!!!!!!!!! Rated 5 out of 5 by Poutoule from Save 3 restless souls..... Played 40 minutes, casual - 3 modes, casual, advanced, soul savior, you can change mode while playing - Integrated SG which shows 3 chapters plus a bonus play - Notebook - Interactive map which shows areas of interest - You can combine items in your inventory, the ones you can combine are marked in green - Voice overs - Shortly after playing you get a raven that will help you gather things out of reach. You get, while playing, different powers for your raven : air, water, fire, earth. You've got to play a mini game to acquire your power and one [b]each time[/b] you want to use one, it empties after you use it. - You get a puppy right at the beginning of the game and, throughout the game you collect medas (5) for him and other items, you can then buy him things and play other mini games. There an arrow at the top left of your screen, use it to access your puppy. - Hint is useful outside H0 - Skip button - H0, you interact, only came across one during the time I played - A lot of interesting mini games, some new - Gorgeous graphics - Didn't pay much attention to the music, so it must have been OK :$ You're riding home, with your dog, on the subway and end up in a cemetery... Here you discover you have to save the souls of 3 people before you'll be set free as well as your dog who's kept as an hostage... This Redemption Cemetery look really good, I had been a little disappointed with the previous one but this one grabbed me straight away. A buy for me. Rated 4 out of 5 by deeds0101 from Not as good I played this one and couldn't say I liked it like the others. Children's plight, grave testimony, and curse of the raven were better games. I thought the graphics on the other games were better too. The visual wasn't as good on this game, but the sorceress was beautiful. The story was ok but I really wasn't crazy about it. Also this game was glitchy on my computer. I had to delete it and reinstall it..It could be me but I just didn't like it as much. Rated 4 out of 5 by awatomic from Colourful fun I really enjoyed playing this game. The colours were beautiful and the mini games well designed though not too challenging. Plenty to do and find and the puppy animation was really cute. The Zoo sequence was wonderful, and I would have liked to see more animals. Some of the hidden object artwork was a little difficult to distinguish and the artwork was variable, but all in all a great addition to the series. Rated 4 out of 5 by Sere82 from Good game but did not hook me completely..Technically is very well done, good graphics and soundtrack, many different locations to explore, interesting stories to play for helping the lost souls to find peace..various HOS, some really tricky, and easy but funny puzzles..Cute our little pet and nice the idea of minigames to play with him..There is an interactive map, showing you locations with available tasks, the helping crow, and a journal.. 3 modes of gameplay to choose from, you can change it while playing..Took me round about 4.30 to play the full game, bonus included, needed to complete the collection of medals for the puppy and unlock the minigames, but the story ends conclusively even without it.. Is a good game, perfect as SE, but missing something to be a 5 stars Collector Edition.. Rated 4 out of 5 by Granny512012 from Gotta Love Redemption Stories!! Only 1 thing to say....BUY IT!!! Rated 4 out of 5 by judeejuju from A good game The game started off really well, interesting storyline, good graphics, jump map, interactive and varied HOs and puzzles which were slightly challenging, although well-known, What let it down a little for me was that it felt relatively short with only 3 chapters and the bonus chapter. Also the zoo chapter just seemed 'out of place' with the rest of the game...but maybe thats just me. Very good bonus chapter tho, so overall i did enjoy the game and would recommend.